I posted an article earlier this month comparing the monthly unemployment rate under President George W. Bush with the most recently available unemployment data under President Obama. However, many of my left-leaning readers were also interested in a comparison of George W. Bush versus Bill Clinton. So, against my better judgement, I conceded to their demands. 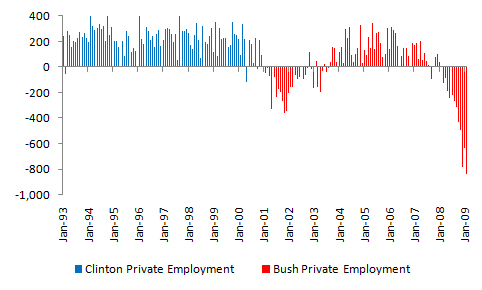 On total private sector employment, the numbers were not even close. From January 1993 to December 2000, businesses created over 21 million jobs. Businesses only created 141,000 under the Bush Administration. Businesses created nearly 150 times as many private sector jobs under President Clinton than they did under President Bush. Of course, the Clinton administration did not face September 11th, two wars, Hurricane Katrina, and a full-blown financial crisis. That said, the point is not to assess blame or credit on either administration, it is merely to report the facts. Despite presiding over a much more robust environment for job creation, President Clinton presided over an economy that had a surprisingly similar average unemployment rate to that during President’s Bush’s tenure — 5.2 vs. 5.3%. However, I suspect that the difference is mainly due to the fact that the Bush presidency was marked by a steady decline in the labor force participation rate. The labor force participation rate measures the number of people in the labor force as a percentage of the total working-age population. Therefore, the unemployment rate likely remained low under Bush because many of the unemployed simply stopped looking for jobs. Again, employment statistics are the result of a myriad of complex factors. I will leave it to my readers to determine why there was such a pronounced difference in employment statistics between the two presidencies. This entry was posted in Business, Finance and Economics, Media, Policy, Politics and tagged President Bush, President Clinton, Unemployment. Bookmark the permalink. We’re seeing the say discouraged worker phenomenon now. Some of it may the aging population as well though. There are a ton of reasons why Clinton’s record was stronger. Some of itwas likely the discouraged worker phenomenon under Bush and the aging population. There was also the stock market bubble as well. Actually, Bush inherited a Clinton recession part of which included a disastrous tech bubble bursting where stock market investors lost about 40% of their wealth. Then came 9/11, which was cause for substantial concern, generating two wars. Finally, Bush presided over the financial industry housing bubble bursting, a situation not of his own making. When you take into consideration that Newt Gingrich had a huge part in making Clinton look good by restraining spending and cutting taxes, you have to admire Bush for keeping the economy going as well as it did during those years. Obama, like Hoover, inherited economic problems and, like Hoover, promptly proeeded to do all the wrong things. FDR took some bad economic times and managed to extend them for several years, and it looks like Obama is trying the same failed stuff. Don’t look for improvement for some time if BHO stays in office. Indeed. As you suggest, some economists have argued that much of FDR’s policies actually extended the Great Depression. Bob, that sounds like the kind of interpretation of history that is designed to pin all problems on “the other side” and thereby make it seem like ones’ own side did nothing wrong. Both sides can play that game since power is divided and there’s always a way to blame someone else. But the reality is that both parties actually share blame. Clinton and Gingrich worked together — one could argue that Clinton made Gingrich look good. The deficits and debt grew most dramatically under Reagan, whose administration dismissed budget deficits as unimportant. Of course, the Democrats didn’t challenge this and went along with it. Both sides share blame. Deregulation was the main cause of the bubble economies, and both sides pushed for that (Clinton refused to regulate derivatives in the famous Brooksley Borne incident in the late 90s). Bush and Greenspan responded to 9-11 by wanting to make sure the country didn’t go into what should have been a real recession in late 2001. That meant flooding the market with cheap credit and stimulating the economy, setting up the housing bubble. So don’t try to interpet it as just the Democrats being wrong — I’m not saying that on partisan grounds, only on the fact that if we are to deal with the immense problems we face, both sides have to stop playing games, recognize they both contributed to this mess, and they have to compromise and make tough unpopular choices to get out of it. I’d also look to Germany as a country that seems to be handling this better than most — what can we learn from Angela Merkel’s approach (which is different than Obama’s). Hindsight is 20/20 but the bottom line is- we escaped the great Depression- and we also learned about what to do should it happen again. Bernanke is an expert on the subject- and his appointment is no mistake. Some say we should have let the banks fail- but that would have meant everyone’s 401k’s being devastated. easy solutions to complex problems are often counterproductive. As baby boomers hit retirement in the coming years they can thank Bush and Obama policies that allowed them to salvage at least some of their retirement. If we learned anything about Hoovers reaction to the crash it is that what was done was too little too late. This was not the case in 2008. Our economy is already turning around though many point to Europe as signs that we may be headed for worse. Some of the bad times that you mention FDR extending- well that came in the form of Austerity- attempts to try to balance the budget in the midst of a crisis. We should know better. Nearly everyone agrees that it was only WWII spending that got us out of the mess. It was also regulation that prevented it from happening again. One thing most people don’t realize is that had we spent on the war or on social programs or simply hiring folks- however much of a bad deal it would seem to us up close under a microscope, the results would mean the same. Priming the pump of Capitalism, so that all the trillions businesses are sitting on now would translate to jobs, and more than just jobs, getting the economy moving again. Keynes famously said that throwing a million dollars down a mineshaft would stimulate the economy because of the tools, machinery and manpower that would be expended in retrieving it. This seems to us today ridiculous but it worked. Against all dominant thought at the time it worked. that’s the point of stimulus. It’s the net results we look at not where every single job went- though that serves a purpose. yes it’s expensive but so are bailouts- but none of it is as expensive as massive homelessness and 50% unemployment. Austrian economists may feel confident that their model would not bring that about, but no one is willing to risk the global economy on it now- especially after a decade of tax cutting and deregulation- no one wants to hear about deregulating more- no one serious of reputation that I know of anyway. Macroeconomics is tricky and not at all like balancing a small or even big businesses budget – certainly not as simple as a family budget. We’re in troubled times due to deregulation- not just Bush but back decades. you can’t blame baby boomers for waiting their retirement savings and investments to be their for them. maybe when we’re out of the last deregulation mess we can revisit the Austrians. as it stands now experts are in agreement that austerity has failed and we need controls, including vital regulation that had been missing this past decade. We’re all free marketeers until we’re in trouble. We really need to come together and rebuild the economy rather than fighting to implement new untested models. Traffic signals don’t cause accidents they prevent them. having a few key areas with signals that don’t work- causing numerous pileups- is no reason to abolish traffic lights altogether. It is a time to reexamine them and make them efficient and workable. Really glad I came across this page, as I have been a republican most of my life, I recently left them and became an independent actually somewhat of a libertarian. I really like finding sites and information where being a (as I call them now) demorepublicrats is not as important as seeking the truth and accepting it no matter what it is. I find that a major problem is that so many people have become either a democrat or republican 1st and foremost and an American 2nd. Whats good for the party may not be whats good for America. Sean would you mind if I re post this page on a few Facebook pages that I visit rather frequently? Thanks for stopping by. Please do repost this page on Facebook. The more traffic that links back to this site, the better. I have read things that contradict your statement . My understanding is that President Reagan made a deal with Democrats for tax hikes and they were supposed to give him $ 3 of spending cuts for every $ 1 dollar of tax increases . Reagan called this 1982 deal the biggest mistake he made as President. The Democrats broke their promise , of course .Just as Obama will break any deal he makes with Republicans , if he possibly can . Maybe- but also remember Reagan was trying a brand new economic model and soon after his radical policies unemployment was higher than 10%. Anyway if the Democrats were responsible for the Reagan deficits then what about the W Bush deficits? W had both House and Senate under republican control yet oversaw deficits exceeding Reagan’s. there is a theory that this was on purpose- that Bush over spent and cut revenues (taxes) in order for a broader strategy of eventually eliminating Social Programs. Grover Norquist’s ‘Starve the Beast’ – it abandons traditional fiscal Conservatism, and who knows- it may work. I’m personally a believer in the Social Contract because when you look at economies that didn’t have one- like Cuba in the 50’s and income disparity is so great- it wasn’t pretty. We may oppose spending on the safety net but it’s not going away- if it did we would have serious problems – like Cuba in the 50’s and Russia in the 20’s and Germany soon after.. It’s good for Conservatives to not like the safety net- but it’s also good to realize the good it does, not in mere terms of individual good and compassion- but social good- and how it preserves the free markets from being taken over by revolution. And yes it’s also a point of pride to be able to say our country doesn’t have the huge homeless population it used to before WWII. It proves that Capitalism works for all, even the unemployed. We didn’t have these programs in the 19th century- we didn’t have child labor laws. Liberals are saying that deregulation and continuing to ignore Society as a whole is an attempt to take us back to the 19th century of Social Darwinism- and they have a point. Look at Uganda- small government- not alot of regulation. Look at Sweden with more laws and higher taxes. – or Canada, or even here in the 90’s. No, Reagan said the biggest mistake he made as president was granting amnesty to the illegal alien invaders. Of course, that was the demonrats breaking their promise of border security for amnesty. I was actually looking for a chart to post on your earlier site and saw that you did it already. I have to say I respect you for doing this- you are indeed a Rational Republican! * Hurricane Katrina – perhaps unavoidable but certainly could have been handled much better. Hurricane Katrina is textbook inefficiency. Bush appointed a friend to head FEMA not any kind of expert. * Full Blown Financial Crisis – OK well it’s been pointed out that Glass Steagall was repealed during Clinton’s admin, but remember this was the Gingrich Congress of obstructionism. Clinton agreed to it’s repeal in order to get other things accomplished by a Congress who’d shut down the government. Henry Paulson- Bush’s FED secretary was the CEO of Goldmann Sachs – yes I know Wall Street has men in Clinton’s and even Obama’s cabinet- but CEO’s with an agenda- like Paulson and Cheney (CEO of Halliburton) take this to another level. But let’s put that aside and see what actually happened- or didn’t happen. Paulson should have known about the housing bubble and let the air out. He didn’t even report it. This was due to a hands off strategy- let government run itself (into the ground). When markets crashed he rescued some banks- and gave them no accountability- a loan to be sure that was paid back but the insider trading that occurred because of this and the some trillions that experts investigating couldn’t find- not a trace of. that was TARP- again like the wars the amount spent was vastly underreported until much later sticking the next administration with the damages. You’ll also recall that Clinton did have a financial crisis- the Tech Bubble. It failed to take down the economy- though who knows- a little less regulation say on emerging tools such as derivatives – or a religious belief that regulation is always bad- it may have become as huge a tragedy for America. In summary, Sean each of the excuses Bush may have as to why Clinton outperformed him could have been handled better with better men working for him. If Bush had listened to Richard Clarke, or hired a better FEMA guy or a more accountable and impartial FED chairman- these could all have been blips on the radar- the kind Clinton had and dealt with regularly. 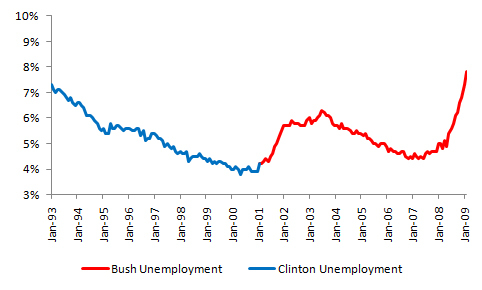 Excuses as to why Reagan’s job creation record was worse than Clinton’s- well I have yet to hear any. I appreciate you posting this article and chart thanks again. It would be a nice thing to see George HW Bush’s record as well as Reagan’s and Carter’s also if you have the patience or time. I also agree with a fellow poster here that it is useless to assign blame but it is very useful to discuss strategy and what worked and didn’t – what results were sought and what became of them and hopefully we’re wise enough to learn from policy mistakes of the past. eg dismissing the counsel of experts outright- which in my mind was the prime failure of the last decade. A general distrust of “elites” in favor of winging it. Clinton had similar circumstances but also had a competent Cabinet to support him and provide sound counsel. Success doesn’t just “happen” out of luck. How we handle adversity effectively comes down to how we are prepared for it. Stripping the government of agencies meant to protect it, or regulation meant to protect citizens is not always a very wise move. We can learn from the sacrifices made by George W Bush – at least to his reputation if not the decade lost under his control. I would also hope that Future Conservatives find a better economic strategy than merely cutting taxes, because they simply do not pay for themselves. Bush blew Clinton’s hard won surplus in less than a year because he said it would defer spending- which of course it didn’t. It’s like giving away your savings because you’re afraid you may buy something extravagant with it like a sports car- so you just give it away instead- which is what Bush did with the surplus. Bruce Bartlett’s notion of a VAT is a great way to go – a money machine that taxes consumption. I’ll try to respond to the full comment a little later, but just do a search on unemployment and Carter and Reagan on this site. I posted some charts a few months back for them as well. I remembering being very surprised that Carter’s record wasn’t as bad as I thought it might be. Clinton actually did have one war — Kosovo. He also sponsored action in Bosnia. I don’t think either of those wars were necessary. The WTC attack when Clinton was president was also not nearly as destructive as 9/11. It wasn’t even close. Furthermore, his methods in attempting to criminalize terrorists rather than hunting them down and killing them like the animals they are, opened the country up to 9/11. Richard Clarke is a good man, and what happened to him was completely unfair. The same goes for General Shinseki and Tom White. General McKiernan and General McCrystal were also good men, but Obama fired them nonetheless. I think Iraq was more complicated than how both the right and left position it. We all were certain Saddam had weapons of mass destruction. We also needed to have a stronger presence in the Middle East as our position in Saudi Arabia was making it difficult for the Saudi royal family to maintain power. The surge was also an unmitigated success. My view has always been that Bush made three critical mistakes: 1) he went into Iraq with too few troops, 2) he banned the Baath Party after capturing Baghdad (basically telling everyone in Iraq who could read that they could not participate in the country’s governance), and 3) disbanding the Iraqi Army. Had he made only one of these three mistakes, the war may have been far shorter. Again, it was complicated. Because of the Posse Comitatus Act of 1878, Bush couldn’t send the military into Louisiana until Governor Blanco requested it. The Governor did not, and Bush hestitated. In his Autobiography he admits that he should have just steamrolled Blance due to her incompetence (I agree), but there was plenty of blame to go around. However, I do agree that Brown had no business being the head of FEMA. I think they did know about it, but the government rightly feared that if they let the air out of the bubble too quickly, it would lead us to the same situation we ended up in anyway. The bottom line is that there is plenty of blame to go around for the housing crisis including, quotas for low income home ownership at Fanny May and Freddie Mac, exotic derivatives, and good old-fashioned consumer greed. Everyone — both Democrats and Republicans have their share of the mess. The tech bubble burst in March 2001 at the beginning of the Bush administration. Bush, like Obama, provided fiscal stimulus that prevented the country from the worst of its effects. While I agree that Bush could have hired better folks in many cases (but not all), there is very little he could have done to prevent the collapse. This thing had been building for thirty years (in my opinion). I agree with you here. Though I don’t think Bush “winged it.” But that is a matter of opinion, which probably will never be resolved here. I used to agree with you. As I get older and see how the world “works”, luck has far more to do with it than I would have ever thought (or hoped). For instance, my generation probably won’t do as well as my parents’ generation because they were luckier to be born in a more prosperous time. I completely agree. The problem is that the left’s strategy is to demonize the wealthy and increase the size of the federal government. I believe that we need to increase taxes in the intermediate term as well as cut spending. In the short-term, deficit spending and low taxes are required to get us out of our rut. The problem is that both parties are adhering to their senseless dogmatic positions when they should be working together. I haven’t read the book, but my understanding of basic economics is that consumption taxes are the most efficient form of taxation. The problem that many on the left have with it is that it is regressive (I partly agree). That said, if we eliminated all other federal taxes (income, capital gains, etc.) in favor of a VAT, I would be all for it. I’m glad the charts seem to be of value and well received. Since the bar graph presented above comes from one small measure of BLS survey-based data, real comprehensive employment figures might prove of more value. Within the Department of Labor, the Employment & Training Administration is responsible for verifiable nationwide counts. Their data differs significantly from the survey-based predictive estimates that former high ranking officials from the DOL called “deeply flawed”. That was the message from BLS Commissioner John Hall, whose tenure ended in January 2012. Former Labor Department Chief of Staff Rick Manning was more harsh and direct with his criticism of the survey figures, which were shown to have been compromised with phantom survey responses. More than a dozen individuals were identified and part of complaints turned in by coworkers at the USCB, but only one was investigated. Since hundreds of fabricated surveys were acknowledged and admitted by the employee who explained his actions in terms of following orders from superiors, the number of fabricated reports from more than a dozen individuals identified internally as doing the same could have approached or exceeded 2000 per month. For those who don’t understand the basis for the BLS statistics that appear in the monthly Employment Situation Report, the CPS is calculated with just over 50,000 responses, assuming average or better response rates for the month. Where the unadjusted data differs significantly from what the statisticians who parse survey responses expect, they’re given surprising latitude with how the seasonally adjusted figures reaching the American public are calculated, then presented. That’s why the Employment & Training Administration (ETA) counts are vitally important. Because they present weekly figures of new registrants and continued claimants for unemployment after job losses, along with quarterly employers’ payroll record counts from data collected through every State Employment Office nationwide, the ETA counts are far more accurate than anything coming from the BLS. If this will allow an image of related employment data, which includes two more years of results to post, the ETA data shows inarguably why many experts see the workforce suffering more under the Obama Presidency than at any time since the Great Depression. Comprehensive nationwide counts from the ETA differ significantly from the modest survey data collected by the BLS, reaching unprecedented levels of seemingly contradictory counts to data released by the BLS under than the Obama Administration. Since this forum doesn’t appear to have a mechanism for posting images, apparently the ETA Quarterly Employer’s Payroll chart will have to be linked elsewhere. I’ll try to follow up with that in the near future, since the data is eye-opening and suggests something very different from what the above charts indicate here. Fascinating. Thank you for posting this, David. I’m glad you’re open to research that’s not common knowledge or given the reach that BLS data is. The ETA figures are surprising for how differently the sister agency within the DOL shows real, supportable workforce counts, which sometimes appear contradictory to the survey results coming from the BLS. I was unable to find a way to include an important graph showing the ETA quarterly employers’ payroll record counts for our past two Presidents here, but the data for the Obama Administration is ugly. As part of the research I’ve taken on, weekly job loss figures since 2001 have been charted, counted and summarized for every week since George Bush was inaugurated. That data as of the third week of Obama’s sixth year in Office shows his Administration overseeing an economy that’s suffered 113 million jobs lost, according to what are considered new, distinct claims for unemployment. The new claims are also commonly referred to internally as first time claims. In direct comparison between the two Presidents, Americans have lost 107,600 more jobs weekly, on average, and 495,000 more during months with 31 days under Obama than our workforce suffered under Bush during his second term. To arrive at such figures, since the ETA offers little summarized data, I entered more than 2800 data points and worked hundreds of calculations for figures I tried to give wings to ahead of the last election. My Rocky Mountain Perspective site, along with several recognizable conservative blogs had more than 12,000 hits from people who were introduced to the ETA summarized counts. Had the reality been better understood in November 2012 and reached tens of millions, perhaps we wouldn’t be suffering a second Obama term. My background includes extensive post-graduate work in mathematics, math teaching and coaching assignments at the secondary and higher education levels, and leadership roles evaluating college graduates and candidates for professional credentials. I’m a numbers guy who’s not a fan of what the Administration feeds to the media for purposes of controlling the narrative on things like jobs and the economy. The level of spin coming from the Obama Administration is something Americans haven’t had to face before to get a reasonable understanding of what’s going on. Occasionally, I try to help towards that end. You might find the following link helpful, if you’re interested in seeing the charted weekly, monthly, and annual ETA results regarding job losses. The Quarterly Employers’ Payroll record chart with two easily followed graphs was just completed in January and hasn’t been posted yet on the RockyMountainPerspective.com site. It’s appeared on PAN and a couple of other sites, including Y!A in the Politics section, where I answer questions with what I consider mini-lessons while forming the approach I want to take with posts that will reach thousands. Sometimes my material may appear more complex and numbers oriented than some want to read. I try to limit that natural tendency and find visuals, such as the graphs and charts, usually help. If you come up with any idea how to post the graphs here, or want something sent, my email address is next to my avatar image when paging down on RMP to the bottom of the charts there. The value of the ETA’s real employment and unemployment counts could hardly be overstated. I found your post from a link included as part of a Yahoo! Answers question. My words above were posted there to remind some who’ve already been enlightened about the value of ETA counts in comparison to the limited survey responses gathered for Bureau of Labor Statistics figures. The BLS data has appeared progressively compromised and suspect since 2009, leading many to believe there’s one too many letters in the acronym. Perhaps the President’s laser focus found a target, zapping Labor entirely from the picture. I’ve included carefully compiled summary data for workforce numbers for the Bush and Obama Administrations in answer to the Y!A question. The graph from 2005 onward is posted there but not as readable as it has been on other postings. The chart at the top of the page shows cumulative workforce numbers at year’s end in columns on the right. Next to the total number of Americans on employers’ payroll records in January of each year is a summary total of each President’s workforce change. There, the ETA’s nationwide comprehensive counts show George Bush having grown the workforce by 7,043,293 to count 133,886,830 employed Americans in January 2009. After suffering a brutal 8.33 million jobs lost in 2009 and 2010, while more than 10 million newcomers from the ranks of our high school, college, and trade school educated young adults, immigrants and migrants alike, sought entry to the workforce as trained and ready workforce hopefuls, the reality of the shrunken labor force barely scratches the surface. Shockingly, as of Saturday, February 8, 2014, weekly job loss counts topped 113 million under the Obama Administration. Fear not American workers!! To keep the only commonly published BLS rate less embarrassing and painful, more than 12 million have been dismissed to the ranks of Not In Labor Force counts to hide the reality of a still shrunken workforce down 2,948,470 in January at 130,938,360. The Not In Labor Force spike to 92,534,000 outstrips all other increases on BLS data, dwarfing the Obama Administration’s spin suggestive of growth elsewhere. At the start of the President’s sixth year in Office, cumulative data from the Digest of Education Statistics, Yearbook of Immigration Statistics, and ICE internal documents, show between 36 and 40 million new workforce hopefuls ready for independent, self-sufficient adulthood infused into the labor pool in search of jobs. The reality for tens of millions, including nearly half of college graduates since 2009, is frustration and desperation to find jobs that have simply been unavailable.